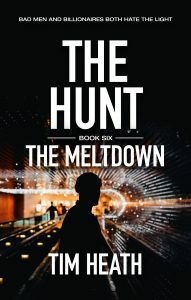 Book Six in The Hunt series. An uncontrollable president. Three unflinching agents. One epic finale. The threat is not the foreign invader, but the danger within. Now they need silencing. Nations, governments and individuals. The president has a secret which he’ll use to threaten meltdown on all fronts. And what of the British and MI6? Operating within the law is no longer their only option. Yet, a greater threat remains; watching, waiting––ready to pounce! From the Best-Selling author of eighteen titles, including The Tablet, comes the sixth instalment in his much loved Hunt series. This series has gripped me from the beginning. It's absolutely packed with suspense, and there are so many twists and turns in the plot that I was guessing all the way through to try and guess where the author was taking this. The ending certainly surprised me. At the same time, it leaves me slightly uneasy, because it does seem to mirror certain aspects of current affairs. Beautifully crafted and constructed, this is once again an intelligent book flows seamlessly. ★★★★★ The end. Or is it? A brilliant finale to a fascinating and thought-provoking series about the rich and ruthless versus the great and (supposedly) good. I said finale yet some loose ends do remain. Could there be more? I hope so! ★★★★★ Really brilliant, best yet. Absolutely brilliant read. So up-to-date and thought-provoking! Could it really happen! Couldn't stop reading it such compelling reading. Think this is the best in the series. Surely it can't be the last one so many loose ends! Next one could possibly be called The Acting President! We need to find out what happens to Alex and Sasha also. I truly recommend you to read this book and really hope there will be more. ★★★★★ Keep Your Wits About You & You Might Be the next Billionaire! Oh my word, the beginning of the story had me with tears in my eyes! I just couldn't believe it, I had to read it twice to make sure I had read correctly! I can not give the GAME away, but I can tell you that you will be in for a joy ride! If you thought the other books good, Book 6 will knock your socks off! The ending cannot be left as a cliffhanger with fiction friends that grew into real friends left out to dry! Alex, Anissa and Sasha, even Rad I want to know more of – those are the ones that have been through the thick and thin, they deserve more! The book is suspenseful, entertaining, great plot, and characters. We have a Russian sniper, who falls in love. Matvey Filipov who now president of Russian, a killing off his enemies. Svetlana Volkov ex-wife of Sergei, and famous actress, who is President aide. What will happen? There is a lot going on with characters in the book, don’t want to give anything away. The author did a great job on the book, and plot, characters, keeps your interest. Highly recommend this book.